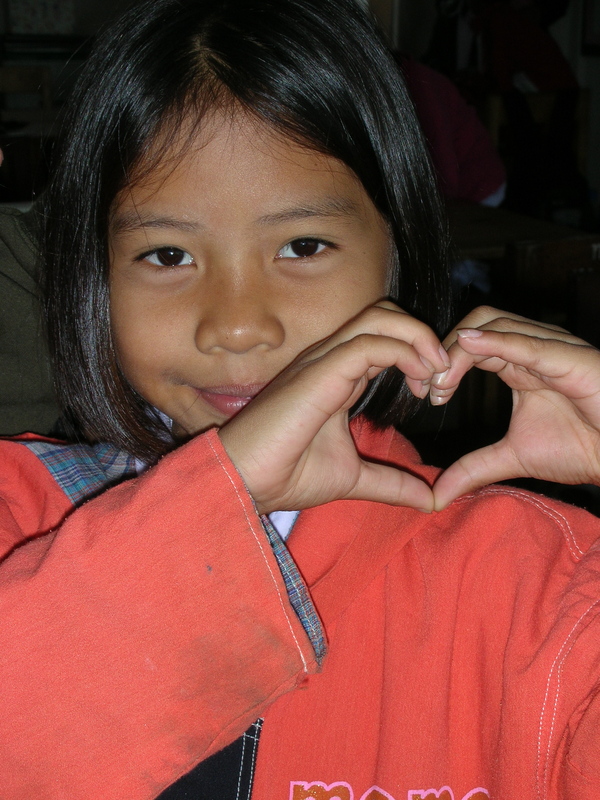 Teaching kids makes you think about all of the teachers you’ve had in your life. What did they go home and tell their significant other at the end of the day? What did we do that disgusted them? What did we do that cracked them up? What did we say without knowing what it really meant? A shot from my elementary school days which were quite different from what a Korean elementary school child experiences today. That's me front and center! Wake Up and Dance was named as one of the Top 50 Blogs for those interested in teaching abroad by www.onlinedegrees.org! Exciting! 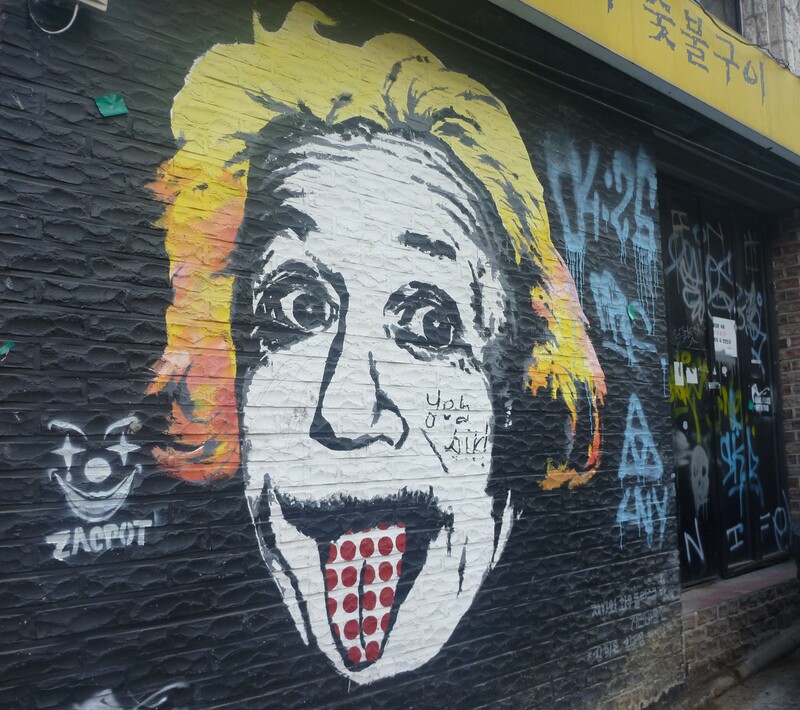 If you or a loved one is thinking about teaching or living abroad, there are some really great blogs to read on their list. 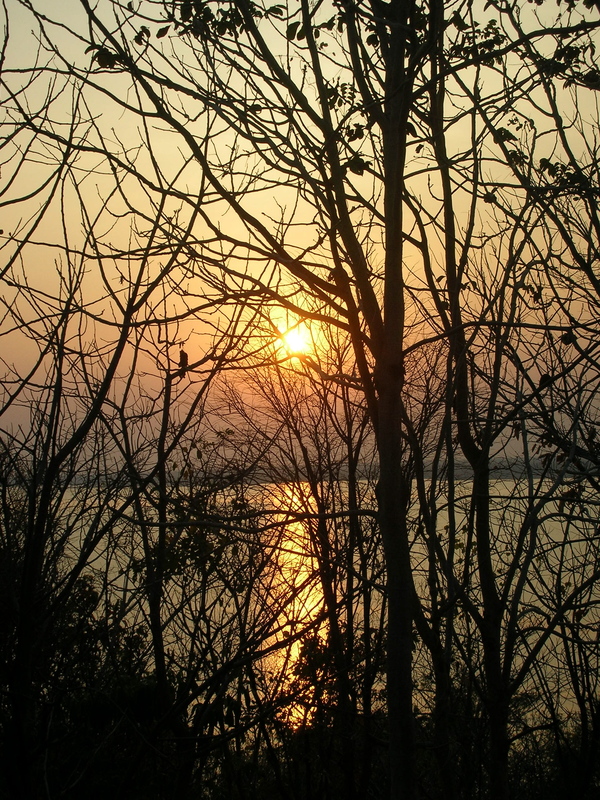 Check it out at www.onlinedegrees.org/top-50-blogs-for-those-interested-in-teaching-abroad/ (Wake Up and Dance is named a little less than halfway down the page). So you got the job, you have the plane ticket, and you are trying to figure out what the hell you need to bring. Because you will be living in the country you are teaching in for an extended period of time, it is important to pack smartly. Your family can send you supplies of course, but this can be costly and sometimes inconvenient. It is best to anticipate what you might need for your entire stay abroad. Depending on where you are traveling to, you might not have access to certain items that you take for granted at home. Believe it or not, deodorant is not sold worldwide. I ran out of deodorant while I was backpacking in Korea and had to have a friend from home bring me some when he met me in China. Even if the country you are traveling to does have deodorant, it might not be a brand you like to wear, so bring a good supply. The same goes for tampons. Many women still use pads around the world, which can make finding a tampon difficult sometimes. When you do find tampons, they will most likely be OB brand. If you like OB and you can find it in the country you will be living in, then you are set. But if you don’t like that brand, then I suggest going to Costco and stocking up on tampons before you leave. Medication is another important item to consider when you are packing. Certain medications can be found abroad for less and over the counter, but you might not want to chance it if it is something you depend on. If you take a specific birth control, acne medication, or some other pill you can’t live without, buy a bunch of it at home before leaving the country. It’s a good idea to look at your daily routine and decide what you can live without. Are you completely set on using a specific face wash, shampoo, or mascara? You will be able to find most of the things you use daily in some form abroad, but it might not be the brand you are loyal to. For example, I am addicted to Burt’s Bees lip balm and would be completely distraught if I ran out, so I bring more than enough lip balm to last me a year. Look at every product you use and if you don’t mind using a different brand, then don’t bring it. If you couldn’t imagine life without that brand, then you will need to bring enough to last you the extent of your time abroad. There are also some more obvious things you should take that I absolutely must mention. Books! Sometimes it can be difficult to find books in English abroad. When you do find them, they might not be the kind of book you want to read. You will be able to trade with other travelers, but you might not always be able to find someone willing to trade with you when you want to. A camera and your laptop are also a must when you are leaving for a long time. Before you depart, make a trip to your dentist and your doctor. Tell them you are leaving the country and want to make sure everything is fine before you leave. Make sure you have all of the necessary shots to travel and maybe request some sleeping pills for the plane ride. Ask your doctor for a prescription of Ciprofloxacin (Cipro for short). This medication is like gold for all travelers. If you get unstoppable diarrhea, this is going to be your new best friend. Nobody wants to have to teach all day or get on a long bus ride with the runs. Before I leave, I take a large Ziploc bag and make myself a medical kit. Key medicines in this kit are Pepto-Bismol, Imodium, Cipro, Neosporin, Nyquil, Midol, and your choice of pain relief medication. I also include a thermometer, Deet, band-aids and duct tape. At some point during my time abroad I have used all of these items and have always been grateful that I had them on hand. Lastly, while you are deciding what clothes to take, make sure you have a good understanding of what the other teachers at school will be wearing. It is pointless to bring pencil skirts and collared shirts if everyone else is wearing jeans and t-shirts. You should consider the fact that you will probably be shopping and buying clothes abroad, so you don’t need to pack too much. And finally, as I’m sure your mom is going to remind you, bring plenty of good underwear! This post was originally written for www.diwyy.com. Last week I went to Scout Camp with the fifth and sixth grade at Nonthun School. All of the teachers involved with the fifth and sixth grade went, along with teachers and administrators who wanted an excuse to ditch school for two days. 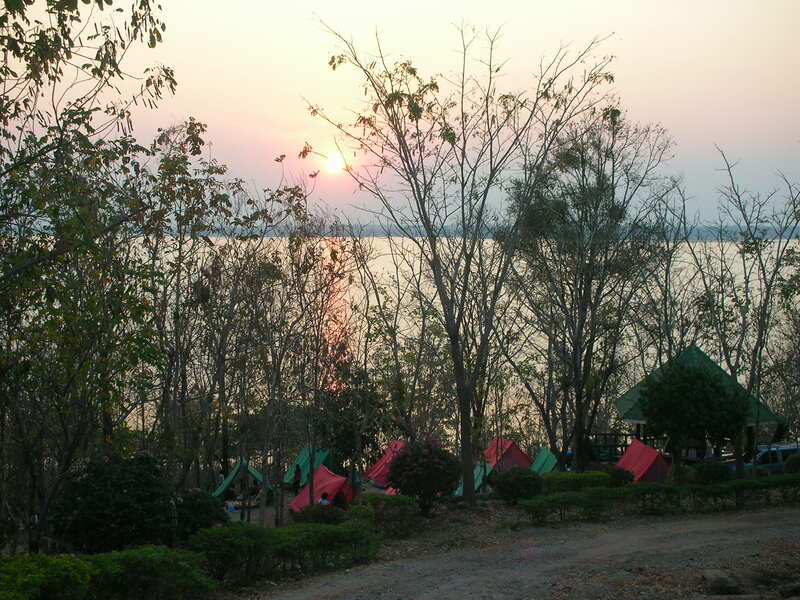 The camp was at Namphong National Park next to Ubolrat Dam. We had had nice weather all week until the day we went to Scout Camp and the temperature shot up. Children were fainting during the opening ceremony and I was surprised they didn’t have any casualties during their two hour hiking adventure. 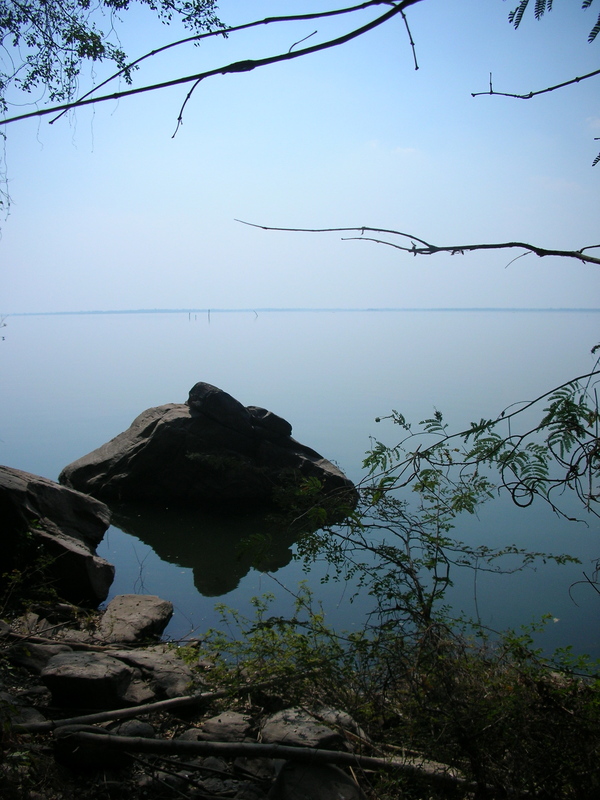 I hiked with them for the first hour but then got a terrible headache, which I thought was due to dehydration, but turned out to be a sinus headache because I came down with a sore throat and runny nose later that night. At night we had a four hour camp fire. It went on FOREVER. It just wouldn’t end. At first I thought it was fun, but then it just dragged on and on and on. While the kids were doing skits and singing, the male teachers managed to get plastered. The Assistant Director, who was in charge of leading the camp fire, got so drunk that an hour into the festivities had to be removed and replaced with a teacher who hadn’t been drinking. It was a disgusting sight. The worst part was that they were drinking at breakfast when I woke up in the morning. I could barely understand when whiskey and beer were consumed at tailgating parties at 6 in the morning at university, but at Scout Camp? seriously???? There were kids around! What is wrong with these people?? The worst part was that they were going to drive themselves (not the kids) home! What a wonderful example we set for the children. Here is a video of the lighting of the camp fire. I was a little worried towards the end…sparks were flying pretty far. The kids surprised me in how self sufficient they were. 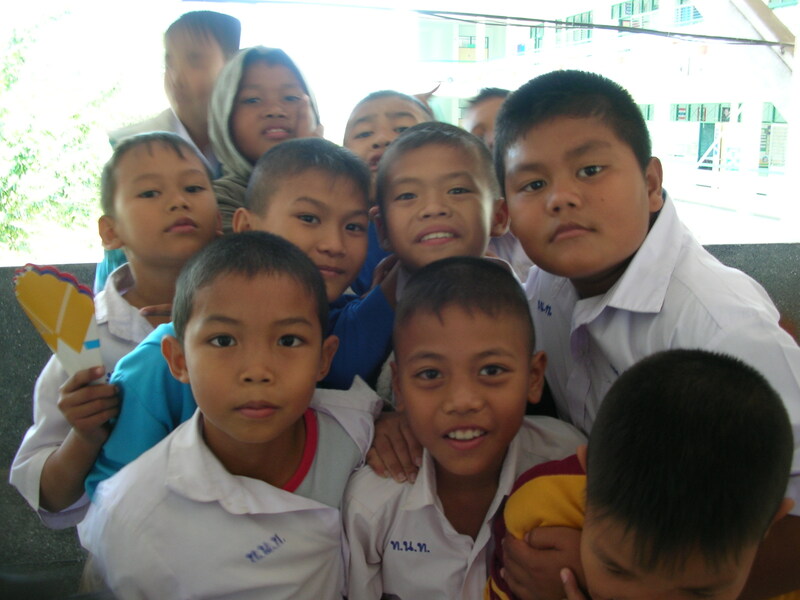 I think that if all of the adults disappeared from Thailand the kids would be able to carry on just fine. 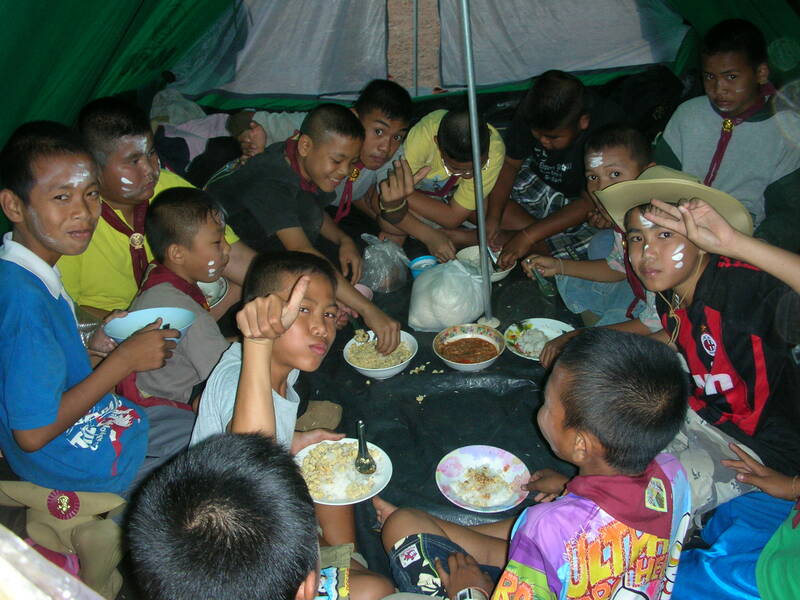 The meals they made outside their tents looked much more delicious than what the teachers ended up with. American kids could learn a lot from these kids about survival. I was very impressed. I chose to sleep outside in a tent that a teacher at my other school lent me because of my previous experience with sharing rooms with teachers. The snores that comes out of these women sounds like t-rex with a sinus infection. It’s terrifying and does not make for a good nights sleep. One of the teachers favorite things to do, that I rarely take advantage of, is the ability to have the kids do whatever it is you desire for you. The teachers use the kids for everything. I want oranges; go get a kilo. I need water. Wash these dishes. Pick the lice out of my hair. Pluck my gray hairs. So when I looked at my tent, I chose to hand it to the closest student. I promise you I don’t use the children like my personal servants, but in this instance I figured that the student and his friends would do it much faster than me and I’m sure I saved myself from being laughed at. 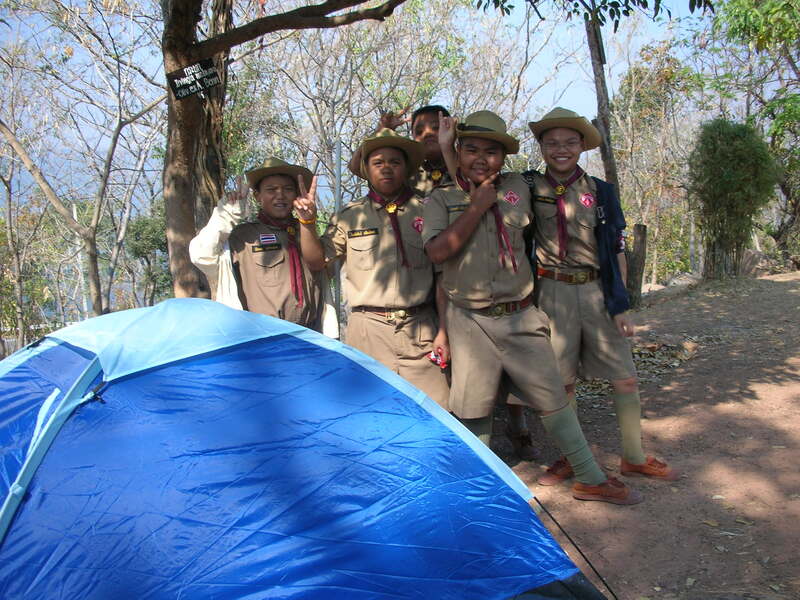 My tent and my students. Only the sword is real. Everyone that traveled with me on Semester at Sea knows that I usually forget to take pictures and I also usually don’t like to. I am trying to work on this flaw since I don’t have anyone here that I can steal pictures from like I did on study abroad. That being said, here are a few photos from the past two weeks. The second picture is dedicated to Haley. 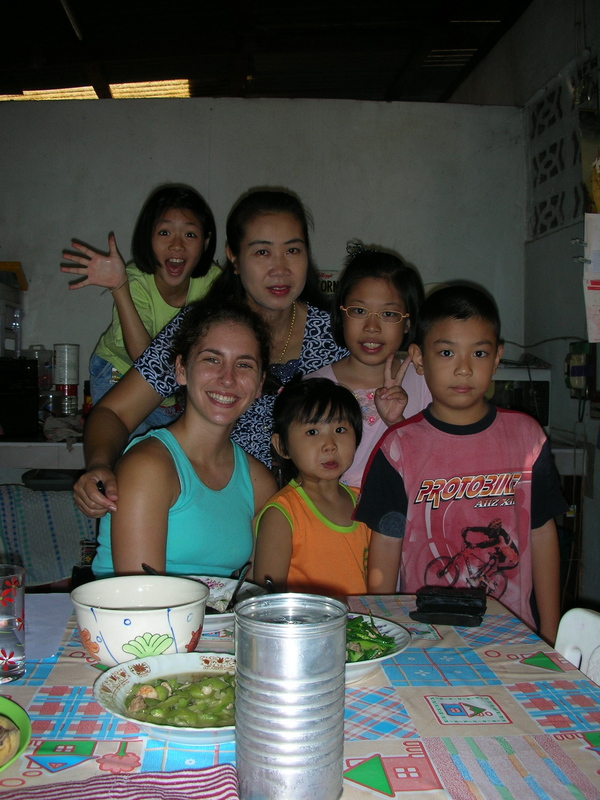 This was the family I stayed with during my first homestay on my second night here. Four people are missing from this picture. I woke up all nine of them on an 11pm emergency bathroom run. It was one of the most uncomfortable nights ever. The teacher in this photo is P'Jum. She teaches Pratoms (AKA grades) 5 and 6. Halloween in Thailand! 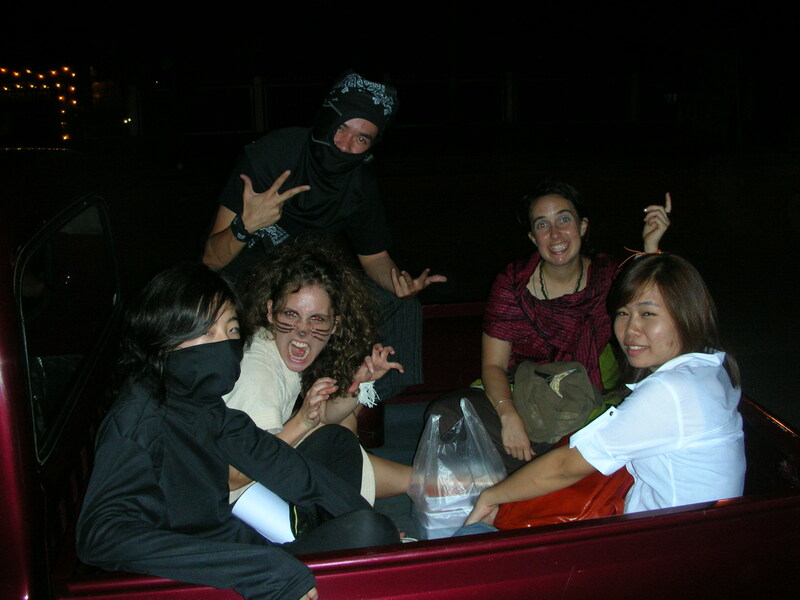 Two ninjas, a lion, and a fortune teller on the way to the Halloween Party at Sunset Bar. Sunset Bar is outside the city and if you call they will come pick you up with their truck. The bar is like an artsy/woodsy version of the Sundowner for all you Boulder folks reading this. 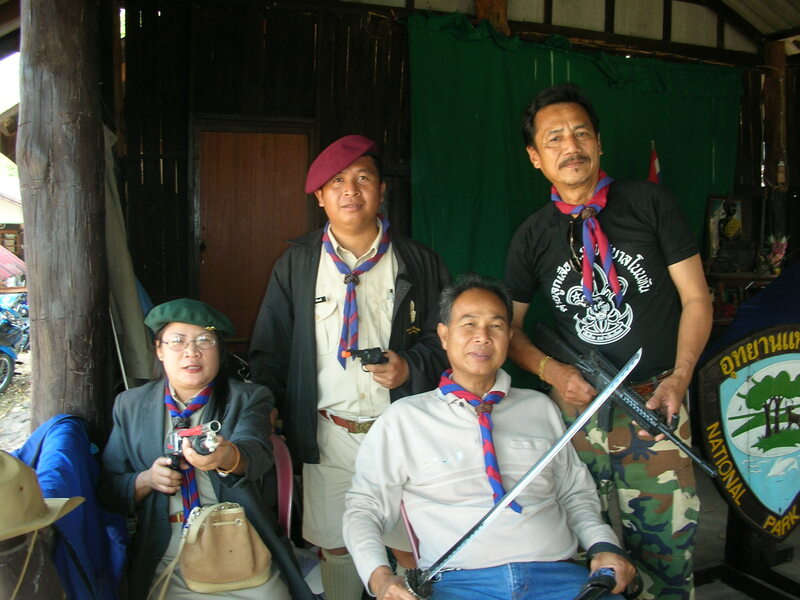 Lunch was taking so long that P'Nok got behind the stand and started helping out. It never would have occurred to me to go pick up a knife and start chopping vegetables at a food stand to get my food faster. English is fun. I swear. 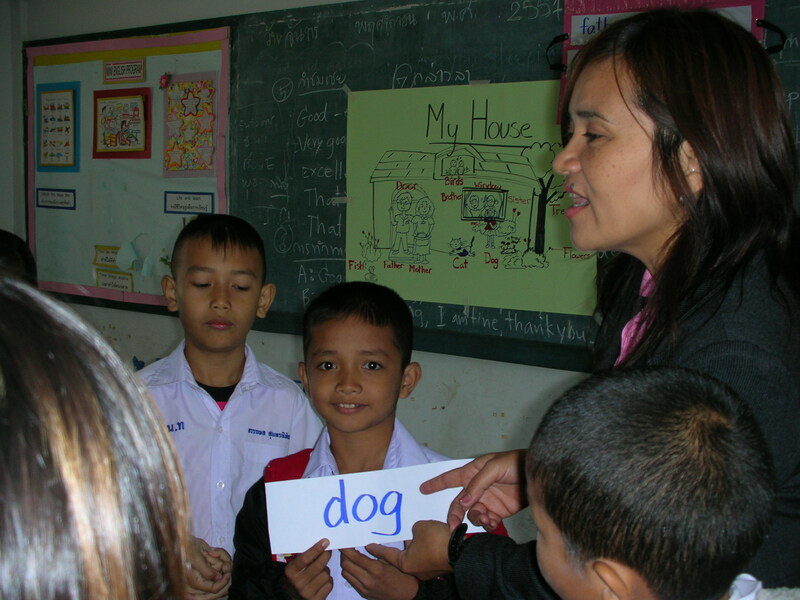 The little boy holding the dog flashcard is one of the cutest! His name is Man. 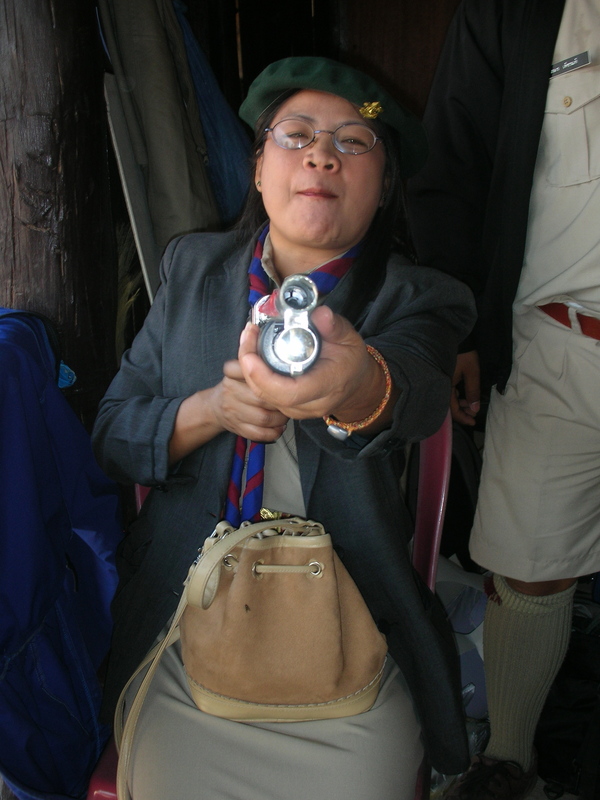 The teacher in this picture is P'Jit, I work with her on Tuesdays. She teaches Pratom 4. Some of the boys from Pratom 4. The Thai dance teacher, P'Daang, and I. Everytime I see her I try to learn a few Thai dance moves. Her class is next to mine every Tuesday. Hopefully by the end of the semester I will have flexible Thai dance hands and I will have a few good dance moves! Chan rat koon. This is what all of the girls from Pratom 4 tell me. It means I love you.